Nicos Baikas, Untitled, 1994, 2000. Pencil on paper, 21 x 29.6 cm. © Nicos Baikas. Faggionato Fine Arts is delighted to present the first exhibition in the UK of new works by the artist Nicos Baikas, born in Piraeus in 1948. The exhibition comprises large-scale pencil works plus a series of smaller works. 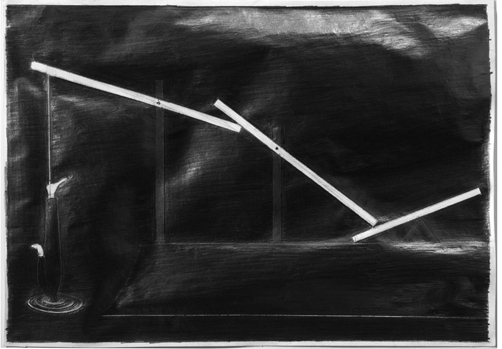 Baikas works exclusively in pencil on paper, creating surfaces dense and heavy, in which objects and shapes are placed in perfect correspondence with the issues he approaches in his work: gravity, geometry and the study of balance into which he entwines the philosophical use of different perspectives. The images are geometrical balances. Squares, circles and triangles are placed alongside simple human forms. Baikas is concerned with creating what he describes as a “visual suspension” as opposed to the “mental suspension” which is often asked of in the viewer/work of art relationship. His works are a study on mental reflection, the philosophical balance of dark and light and the possible fragmentation of order into potential chaos. The tension created is disquieting and the images brooding, often with disturbing connotations. The pencil in which all his works are rendered is manipulated with astounding precision and force. The sheer energy and drama with which the pencil strokes are applied to the paper causes it to undulate and buckle so that it appears as if the medium has been transformed into a metallic surface from which light shimmers. There is nothing extraneous or expressionistic in these works. They are the result of intense intellectual musing. Each image is executed with precise economy of content and a complete distillation of cogent artistic thought. Baikas participated in Documenta 9 in Kassel and public collections include the Museum of Contemporary Art in Ghent and MAXXI in Rome. The exhibition will be accompanied by a catalogue with a conversation between the artist and Paolo Colombo. For further images and information please contact info [​at​] faggionato.com or T +44 (0)20 7409 7979.